What better way to celebrate Record Store Day than with lady-centric music? 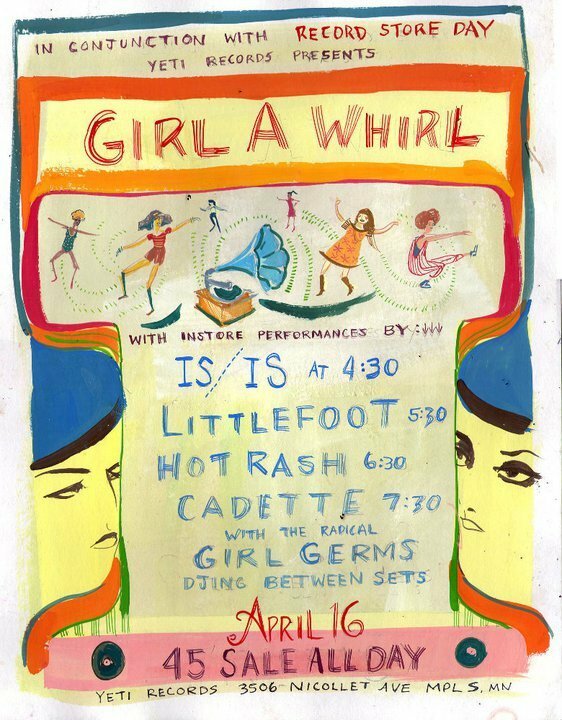 Join Anna and Dana of Girl Germs as we spin jams between bands during Yeti Records’ Girl-a-Whirl celebration on Saturday, April 16. You can check out performances from Is/Is, Cadette, Hot Rash and Littlefoot while you shop and enjoy the Girl Germs music you love so much. Yeti is putting all their 45 RPM records on sale that day, too. Sounds like a blast – see you there! Bands start at 4:30 p.m.
3506 Nicollet Ave. S., Mpls.